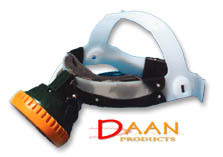 THE HEADGEAR is mounted on an adjustable headgear to insure a comfortable fit. The Headpiece is SABS approved and is water resistant, robust. The Headpiece has a built in on/off switch. This headpiece when used with the DAAN POWER PACK will give you one of the brightest lights that you have ever seen in your life in the headlamp range of torches. It will give you a spot 50 meters away and has been known to shine even further. The power pack is rechargeable, water resistant, robust and is enclosed in a durable plastic. The belt clip is made from aluminium therefore it is rust proof and also accepts the Velcro belts. This is a 6 Volt Power pack rated at 4 Amp/ hour. The life span of this power pack depends on how often you use it. You can charge the power pack as often as you like, as it will not develop a memory. When you use a 0.5Amp tungsten halogen bulb, the power pack will give you approximately 8 hours of continuous use. When you use a 0.85Amp tungsten halogen bulb, the power pack will give you approximately 6 hours of continuous use. 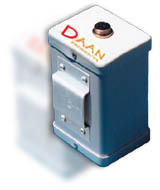 The Daan Charger is designed to charge the DAAN POWER PACK from any 220 Volt AC power source. The charger is fitted with a orange indicator lamp. The lamp is illuminated when charging. 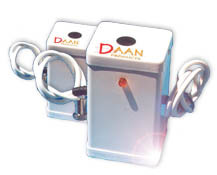 Estimated charge time for the Daan Power pack when using the Daan charger is approximately 4 to 5 hours. In the event that you have a 110 volt power source, please let us know so that we can supply you with the correct charger. This is a travel charger. The Adaan Charger fits into your 12 volt cigarette lighter in your vehicle. The globes used are tungsten halogen globes. There are two different amperage types. 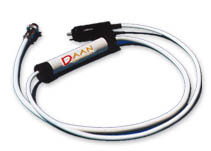 6Volts 0.5Amp : This globe will last approximately 8 hours when used with the DAAN Power Pack. 6Volts 0.85Amp : This globe will last approximately 6 hours when used with the DAAN Power Pack. 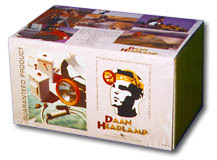 The complete DAAN HEADLAMP kit consists of the DAAN Piece with headgear, Adaan Charger (12v Ac to 6v), DAAN Power Pack, DAAN Charger (220v Ac to 6v Dc/1 AMP output) and is fitted with a Tungsten Halogen Bulb.